Did The F1 GTR's Tricky Headlamps Give McLaren The Victory At Le Mans? The thing about the 1995 McLaren F1 GTRs is that they were race cars which ended up being heavier and less powerful than the road cars they were based on. But that was still good enough for a 1-3-4-5 at Le Mans. McLaren people will tell you that the first GTRs were not much more than F1 road cars with restrictors and roll cages bolted in. That statement is certainly true if you compare them to the Long Tails of 1997 that even came with a different gearbox, but let’s not forget that fitting the ‘95 cars with air jacks and a rerouted fuel system was still one hell of a last minute job. Going back in time with GTR Chief Designer Barry Lett and Senior Vehicle Technician Phil Harding, one can’t help but wonder whether the #59 Ueno Clinic car owes its victory mostly to the pair of crossed headlamps on its bonnet, produced by the team in two days before the race with the aim of lighting up those apexes at night without getting blocked by the F1’s high cheekbones. Probably a key factor in the Le Mans 24 Hour win. 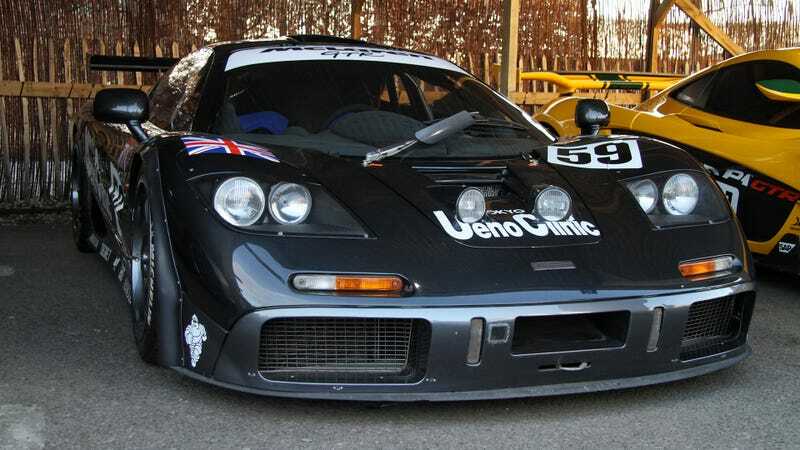 No other F1 GTR had them and during the overnight stint in heavy rain JJ Lehto was able to turn in times that were :30 seconds per lap faster than anyone else. Following its victory, the most famous McLaren of them all went up the Goodwood Hill still wearing the dirt from Le Mans, but at this year’s Members’ Meeting, Keith Holland, head of McLaren Heritage told me it won’t hit the track anymore. But hey, as long as others will, that’s perfectly fine.